Oh la la, I made a bra! Last year I signed up for a bra making course. I have been collecting inspiration for a few years now, and finally I got to learn the ins and outs of sewing well-fitting and good-looking lingerie. 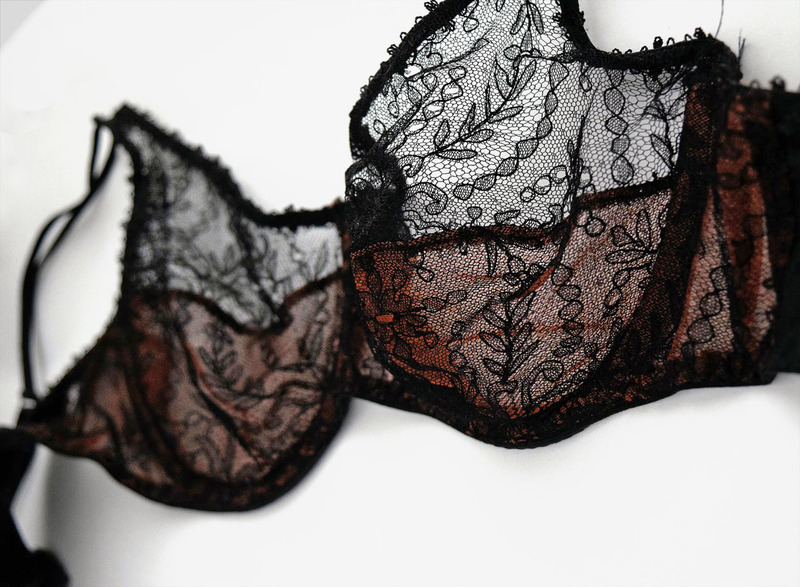 I mostly wear bralettes and non-wired bras, so I wasn’t very keen on the idea of making an underwire bra, but by the time my toile was done I was super excited. I decided to use some vintage lace I bought in Brighton, and I underlined it with some brown mesh that matches my skin tone. The elastic is the only one they had at the fabric shop when I was gathering notions, and although had there been more options available, I would have definitely not picked this one, I think it works pretty well with this lace. It would take a lot of convincing for me to try to learn to make a bra (you say the small size of seams makes it a quick project but I just worry about the precision and the finishing it would require) but yours is very pretty and if it really fits better than RTW then I’m a step closer! Ooo la la and a beautiful one at that! I can’t wait to start making my own lingerie. I’ve been meaning to for ages and am not sure what has been stopping me. Perhaps getting together all the supplies but also it seems so unfamiliar. Perhaps a bra making course could be the place to start! You definitely should! To be honest I haven’t tried fitting a bra, as our teacher did that for us in about 2 minutes, and mine didn’t require a lot of adjustments anyway. But I did try to alter the pattern, and let me just say it’s quite a bit different to moving a dart on a dress pattern. 🙂 But having said that, with a Craftsy course where you can go back as many times as you want, I don’t think you can go wrong and you’ll be so very proud of the finished product!